A Christian Book Publisher since 1998! Exodus Christian Book Publishing is proud to offer a full range of book publishing services to authors throughout the United States and Internationally. If you are in the process of publishing a book for the first time, we know that this is more than a journey, it’s a dream come true! You’ve poured your heart and soul, passion and inspiration out into words… now it’s time to become a published author! We’ll bring your vision for the cover design to life with stellar graphics created just for you based on your ideas and preferences. Next, if your book needs editing, we’ll give it a final polished shine. Then, we’ll typeset your manuscript, creating a professional layout using the fonts and styling from your cover design. Finally, we’ll publish your book and make it available for sale to the world! What makes us different than other Christian book publishers? Integrity. We don’t overcharge and you don’t pay us royalties! After 20 years of authors coming to us from other vanity publishing companies for their covers, interior layouts, book trailers, and author websites, we had that AHA MOMENT! Obviously, they weren’t delivering our level of design or quality, so why not jump in all the way and break the mold of what a Christian book publisher should be? We’re breaking through the ceiling that other Christian book publishing companies have put on your book’s potential! We’ll take you through the entire book publishing journey and after you’re book is published, we won’t take royalties on your sales. (That’s not a typo!) We simply charge for our services – which are thousands less than other Christian book publishers. Everything stays in your control, under your own account set ups, so you can reap ALL the harvest from your book sales! 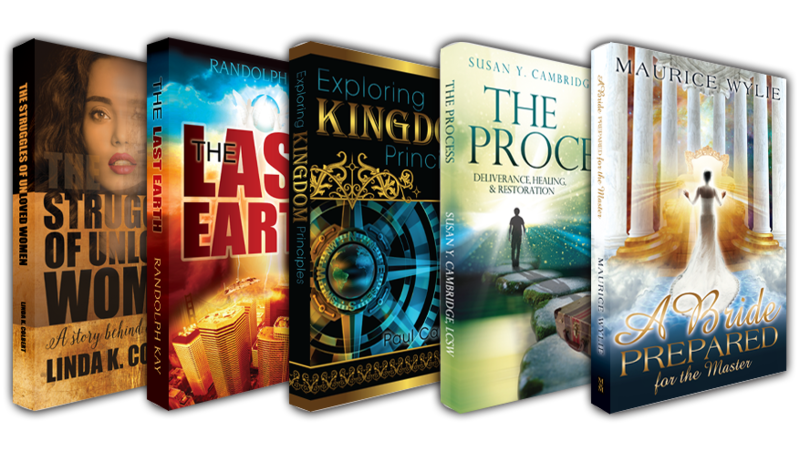 Our Complete Christian Book Publishing Package includes: Custom Book Cover Design, Professional Manuscript Proofing/Editing, Interior Book Layout, and Kindle/eBook Formatting for only $1995. Our All-Inclusive Christian Book Publishing Package includes: Custom Book Cover Design, Professional Manuscript Proofing/Editing, Interior Book Layout, Kindle/eBook Formatting, Christian Book Video Trailer, 4 Week Marketing Campaign, & Author Website for only $3995. You can also get any of our book publishing services alone or bundled into a package created just for you! Already a published author? OR considering a vanity book publisher who’s going to charge you thousands, take a cut of your profits, and not deliver? It’s your book, not theirs. You should benefit more than they do. EXCEPTIONAL Custom Book Cover Design includes 2-3 initial designs, changes until you LOVE it, build out of spine and back cover layout. Learn more and see our Book Cover Design Portfolio! Now that your book is published, it’s time to market it to the world! We get hundreds of visits per day from Christians around the world! Once your marketing materials are ready, you’ll need an author website! Any other pages you want! Your author website comes with hosting & a domain name! With our all inclusive website packages, your hosting and domain name are free for the first year! We’re excited to learn about your book! Call us today at 952.432.7956 or email us for more information!